More than 1,000 apprenticeships have now been created since the start of the Crossrail programme in 2009. Andrew Jones MP, Exchequer Secretary to HM Treasury, visited the new Elizabeth line station at Tottenham Court Road to meet current apprentices and those who have qualified and gone on to secure work on other infrastructure projects including Tideway and the Northern Line Extension. 710 apprenticeships have been created by Crossrail Limited and their contractors during the construction and fit-out of the new stations and tunnels under London, far surpassing the original target of 400 apprenticeships. Apprentices have been trained in a range of professions from civil engineering and business administration to railway systems and mechanical and electrical engineering. Network Rail, Bombardier Transportation and MTR Crossrail have also created 297 apprenticeships as part of the upgrade of the existing rail network for the Elizabeth line, and the manufacture and operation of the new Class 345 trains. 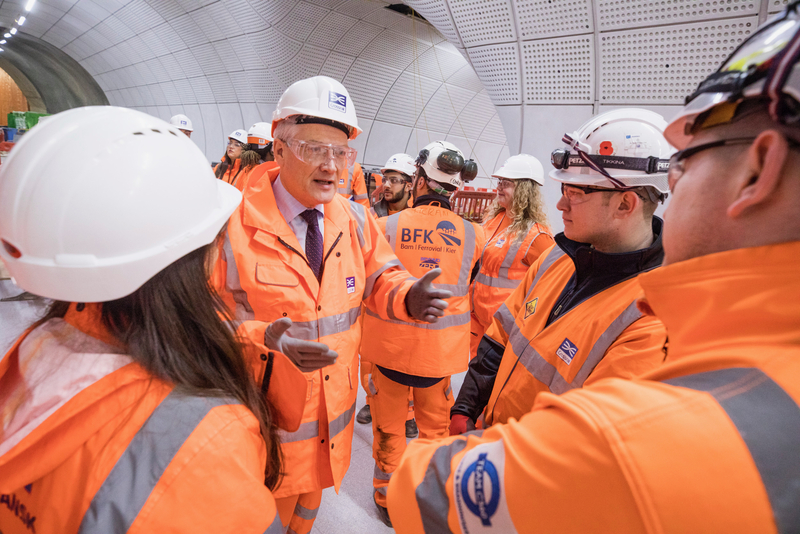 Exchequer Secretary to the Treasury, Andrew Jones MP, said: “I want to commend Crossrail and its partners for taking on the 1,000th apprentice. This is a really impressive milestone which supports the Government&apos;s commitment to see 3 million more apprenticeships by 2020. Transport Apprenticeships and Year of Engineering Minister John Hayes MP, said:“People know that I have championed vocational skills as both a Minister and Shadow Minister and recognise the significant contribution apprentices are making to Crossrail – one of Europe’s largest infrastructure projects. 2018 will see Government and industry join forces to inspire the next generation of engineers for the Year of Engineering, and I have no doubt that the achievements of Crossrail’s apprentices will play a vital role in encouraging young people, their parents and teachers to see the immense value and opportunity of the profession. Over 40,000 students taught about the project and engineering through the Young Crossrail programme that partnered with local schools along the route. When the TfL-run Elizabeth line opens in 2018 it will carry over 200 million passengers per year, adding 10 per cent capacity to central London’s rail network. It will link London’s key employment, leisure and business districts – Heathrow, West End, the City and Canary Wharf, and encourage regeneration all the way across the capital. The route will pass through 41 stations from Reading and Heathrow in the west, through new twin-bore 21 km tunnels to Shenfield and Abbey Wood in the east. The Transport for London (TfL) run railway will be named the Elizabeth line when services through central London open in December 2018. The Crossrail project is being delivered by Crossrail Limited, a wholly owned subsidiary of TfL, and is jointly sponsored by the Department for Transport and TfL.